BRIMBO is a club for local bikers interested in riding their bikes and socialising. 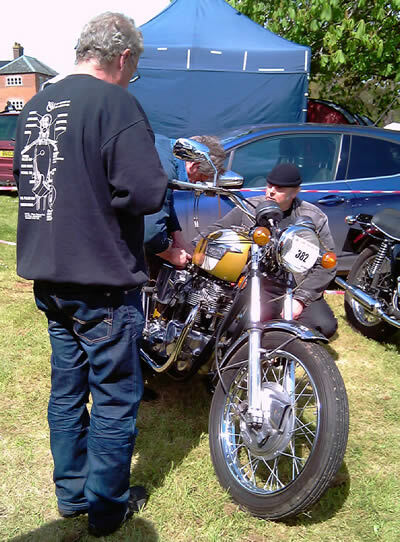 Founded as a group for keeping British bikes on the road, the club now welcomes members with all makes and ages of bikes, although many of the shows we attend favour older marques. A committee meeting is held on the 3rd Saturday of the month at 2.30pm Nov - March and 11am April - Oct. Everyone is welcome and the committee is made up of all members who attend on the day. If you have any articles or photographs for publishing in the next newsletter, please submit these to the Newsletter Editor by the 20th of the month. BRIMBO monthly meetings are held at Billingford Horseshoes, IP21 4HL on the A143 Harleston Road, close to the Norfolk/Suffolk border and about 5 miles East of Diss. Meetings are on the first Wednesday of each month, when the bi-monthly newsletter is distributed. £12 in advance or £15 on the door. If interested, contact Rodney to pay for your booking ASAP. 13 individual black and white line drawings. £8.00 each, plus £1.50 P&P where applicable, or call in at the Horseshoes, Billingford on a Wednesday evening to collect your calendar.